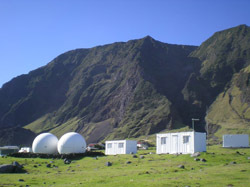 The scientific network of the Preparatory Commission for the Comprehensive Test Ban Treaty Organisation (CTBTO) includes a monitoring station on Tristan da Cunha to detect natural and man-made phenomena. 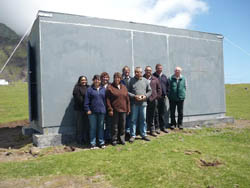 Maxime Le Maillot managed the Tristan CTBTO Station from September 2012 and sent these pictures of the station situated on Hottentot Fence which houses a variety of scientific monitoring equipment described below. 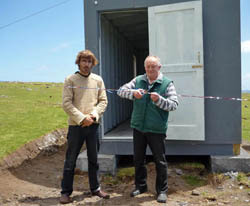 Station Manager Jeremy Peychaud has sent pictures and a report of the latest scientific monitoring station to be installed on Tristan da Cunha. This station is located in Hottentot Fence or Field (also Tristan’s golf course!) with the previously installed CTBTO facilities. 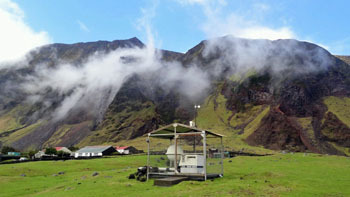 This fourth station completes and finalises the Tristan da Cunha site; the three first were radionuclide particulate, infrasound and hydroacoustic stations. The detection system is made by the Swedish company Gammadata, is named SAUNA II (Swedish Automatic Unit for Noble Gas Acquisition) and is a fully automated system for detection of radioactive Xenon gas in the ambient atmosphere. The concentrations of the four isotopes 133Xe, 135Xe, 133mXe and 131mXe are measured using a sensitive - coincidence technique. The system, divided in three main parts (sampling, processing and detection), performs the activity measurement of radioactive Xenon isotopes in 12-hour samples of ambient air. The sampling system collects about 16m3 of ambient air which will be warmed-up to 300°C in order to get purified from moisture, water and carbon dioxide. 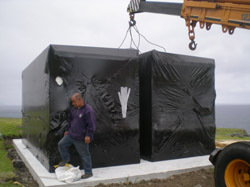 Charcoal traps will then absorb the Xenon and the remaining gas will be evacuated. Helium is used in order to flush this Xenon to the processing unit. Into the processing unit, the Xenon is once again purified from the remaining carbon dioxide and will finally be quantified and further purified by using a gas chromatograph. The Xenon sample is now introduced into one of both detectors. The detection part consists in a sensitive beta-gamma technique, where the beta particles are recorded in coincidence with the gamma radiation. Then the measurements are sent off to the CTBTO headquarter in Vienna (Austria) in order to be analysed to see if any of the four Xenon isotopes are present. Works for this station started in December 2009 and the station was fully installed in May 2010. In between, civil works have been performed; a shelter has been built in France, transported up to Tristan in two separated parts and has been installed and put together in March 2010 thanks to the Tristan mobile crane and finally two Gammadata noble gas experts, Ola Pettersson and Andreas Frisk, who came to Tristan for the system installation in April 2010. A ceremony was held on Friday 14th November 2008 to open the new Station Magnetometer Building which is run by Danish Meteorological Institute (DMI) and the Danish National Space Institute. 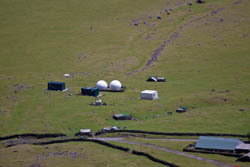 The first part of the magnetometer station on Tristan da Cunha is in operation now. A ribbon cutting ceremony on Friday November 14, 2008, to mark the start of the station was attended by the Tristanians involved in the project, by CTBTO Station manager Leo Genin, the heads of departments and administrator David Morley. In the previous months, Leo had organized a pilot survey of the area on the 'golf course' and then the erection of the hut that houses the instruments. On Tristan, we are monitoring the strength of geomagnetic field, that is the natural magnetic field of the Earth, now with very high precision, says Juergen Matzka from the Danish Meteorological Institute. The data contains magnetic effects from all sorts of processes, for example the sunshine hitting the atmosphere. This is very interesting, since Tristan is located in a huge anomaly, where the geomagnetic field is too weak and too steep compared to other places on the Earth. 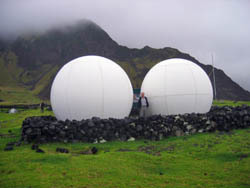 Juergen, who visited Tristan in 2004 already, will add more magnetometers to the station in 2009. He is very grateful for the support for this project by the Tristanians and their government, by colleagues from the South African Hermanus Magnetic Observatory, and for the excellent work of EnviroConsult and the involved Tristanians. The magnetometer station is a joint project of the Danish Meteorological Institute (DMI) and the Danish National Space Institute, funded by the Danish Natural Science Research Council. 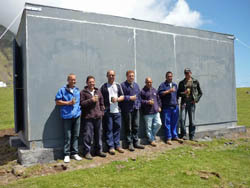 Photograph of some of the Tristan workers who helped with the CTBTO building project from Leo Genin. From left to right: Dave Glass, Donny Green, Robin Repetto, Dion Green, Gerry Repetto, Graham Rogers, Shane Green. Heads of Department are shown outside the new CTBTO Station Magnetometer Building as they gathered for a commissioning ceremony on Friday 14th November 2008. Carlene Glass-Green, Iris Green, Lorraine Repetto, Marlene Swain, Jimmy Glass, Stanley Swain, Andrea Repetto, Keith Green and Administrator David Morley. 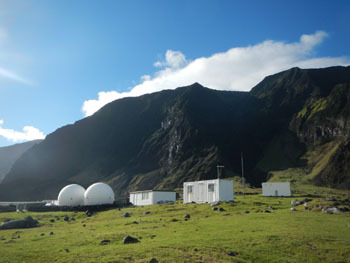 In addition to its IMS infra sound and radio nuclide facilities, Tristan da Cunha also hosts one of the network’s 11 hydro acoustic stations used to detect natural and man-made phenomena in the oceans, including underwater nuclear detonations. 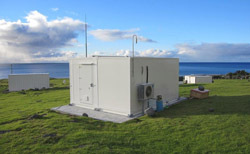 This so-called T-Phase station is one of five of this type located on oceanic islands and utilizing seismometers to detect acoustic waves that are converted to seismic waves once they hit land. 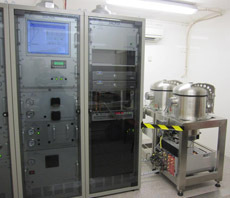 The Hydro acoustic T-phase station HA09 consists of two three-component seismometers. The northern one is located near the Settlement (see photographs above and below) about 500 m from the coast while the western one is located at the Potato Patches about one kilometre from the sea. In each element site, three principal sub-structures can be found: a data acquisition system, power supply system and satellite communications system. At the northern element site near the village, cultural noise includes people, vehicles, etc. Although livestock are virtually the only source of human-related noise in the vicinity of the western element site, this area is subject to extreme sporadic winds. Edited information from the CTBTO Preparatory Commission's website in consultation with their website management. This new IMS station was designed collaboratively by the CTBTO Provisional Technical Secretariat and Nanometrics with Guralp Systems providing the construction management and support. 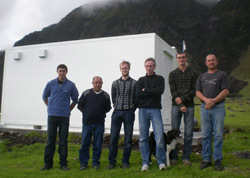 In total, three trips to Tristan da Cunha were required to complete station installation. The first visit, the site survey, took place in November 2001. Site preparation and construction took place in September and October 2003. 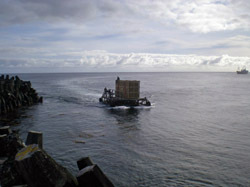 The final installation mission took place from 16 January to 23 March 2004. Due to the extreme remoteness of Tristan da Cunha and the lack of regular transport, the installation team completed site construction and conducted equipment installation and certification tests all during the same visit. Data began to arrive at the IMS Laboratory in March 2004. Following tests the station was certified in December 2004. 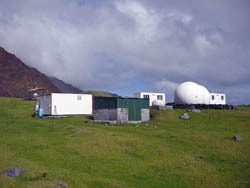 We reproduce a letter from Andrew Allen, Head of Southern Oceans Team, OTD to Ambassador Tibor Toth, Executive Secretary, Provisional Technical Secretariat, Comprehensive Nuclear Test Ban Treaty Organisation , Vienna International Centre,Vienna, Austria, in which he highlights the crucial contribution that the station makes to providing 24/7 electrical supply on Tristan da Cunha. As you may know, a fire on Tristan da Cunha in February this year severely affected the supply of power to the island, with implications for the three IMS stations the UK hosts there and of course for the islanders themselves. The fire has helped highlight the crucial role played by the Comprehensive Nuclear Test Ban Treaty Organisation (CTBTO) in the supply of continuous power to the island. This role has depended on a close co-operation between the CTBTO, the island authorities and Ovenstones, the company which runs the fish processing factory on the island and which is also responsible for management of the power supply to the island. The CTBTO, through their agents Enviroconsult, runs the three IMS stations, which help contribute to international nuclear non-proliferation efforts. Of more immediate relevance to the daily lives of islanders is, however, the fact that the CTBTO has, since around March 2004, continuously provided 8 hours of electricity free of charge to the island, during night-time hours. 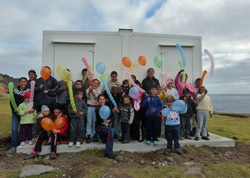 Added to Ovenstones' supply of electricity for 16 hours a day, the CTBTO’s generous and voluntary contribution enables the supply of power 24 hours a day, 7 days a week to the islanders. 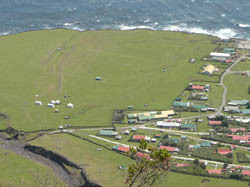 The UK Government is highly appreciative of the CTBTO’s essential contribution to the life and economy of Tristan da Cunha , and is sure that the islanders themselves are equally appreciative. I very much hope this close co-operation with the CTBTO can continue to flourish.